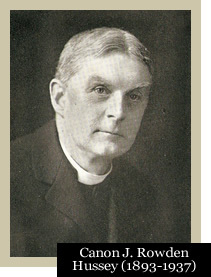 21 September, in 1893, with Canon Rowden Hussey as its first vicar. The tradition of the church has always been firmly Anglo Catholic, and a daily Eucharist was celebrated in vestments from the outset. before a permanent church could be built, but his family gave the land and finance for the church to be built in his memory. The church quickly became known for its dignified worship and excellent music and both were developed further in the time of Canon Rowden Hussey's son Walter as second vicar. The latter commissioned for the church, often at extraordinarily low cost, an outstanding succession of fine works of art. Henry Moore's sculpture and Graham Sutherland's painting are the most tangible evidence of this in the church, but musical works by, among others, Britten, Rubbra, Finzi and Howells, and literary commissions by Auden and Norman Nicholson were also obtained. Canon Walter Hussey's pre-eminence in this field of the church and the arts was recognised by his appointment in 1955 to the Deanery of Chichester, where he was to continue his pioneering work. Commissions under the following vicars of St Matthew's have contributed to this field, and whilst its congregation takes justifiable pride in the splendour of the building and cherishes the tradition of dignified liturgy and the excellent music, it nonetheless recognises that the church exists to bring the gospel to the local area of Kingsley.